If you are as busy as most women are living in the city, it’s time you treat yourself to a no-chip manicure and pedicure in Manhattan, NY. With Dyanna Spa’s gel manicures and pedicures, your nails will retain their shimmer without chipping, cracking, or smudging for up to fourteen days. What is a gel manicure and pedicure? A gel manicure and pedicure is very similar to, yet very different from a regular mani/pedi. After our nail technician cleans, files, soaks and buffs your nails, and after she pushes back your cuticles, she applies a gel substance that looks very similar to nail polish. For the “Shellac and OPI Gel Manicures and Pedicures”, our manicurist applies a base coat, two coats of whatever color Shellac Gel nail polish you desire, and finishes up the manicure and/or pedicure with a top coat. She does the same for the “OPI Shellac Gel French Manicure and Pedicure” except she uses two coats of the OPI Shellac Gel French Pink, with a strip of OPI Shellac Gel French White across the nail tips. For a fast and even finish, an ultraviolet light dries the nails in just a few minutes in between each coat. The UV light cures the no-chip polish, making the nails stronger and glossier, while ensuring the mani/pedi lasts longer than regular nail polish. Just think – with these fashionable high-gloss manicures and pedicures, you won’t have to worry about your nails for at least two weeks. Just be sure to come to our NY nail salon with bare nails, without polish or anything else on them. We do not advise that you remove your gel nails by yourself. One of our nail technicians can easily remove them without soaking, filing, or drilling. 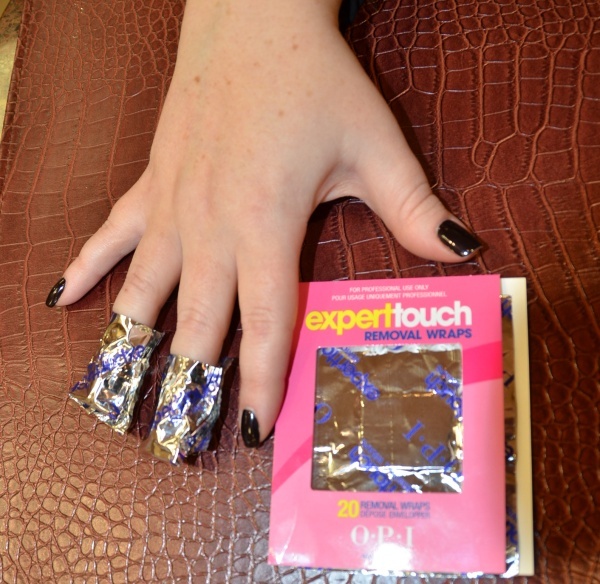 She simply wraps your nails in our specially formulated cotton wraps, precisely tailored to fit just your nails. Our Shellac / OPI Gel Soak-Off Manicure or Pedicure costs $10.00 each. Get your fingernails and toenails looking gorgeous in our NY nail salon, with one of our shellac gel manicures and pedicures. Just give us a call, schedule an appointment online at our website, or simply stop by Dyanna Spa & Nail Salon. 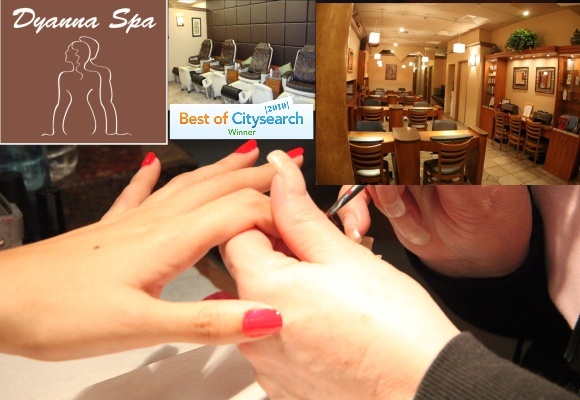 We all know that busy New York women don’t always have time for a weekly manicure at their favorite Manhattan spa. 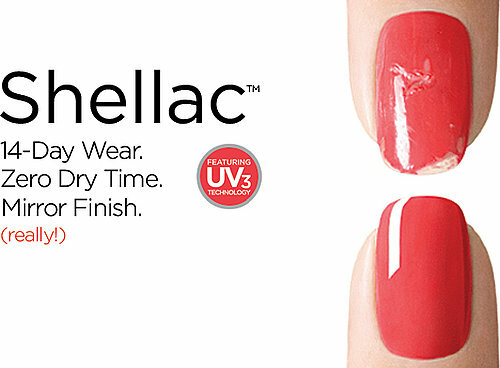 For those that need a manicure to last, Dyanna Spa in NYC is proud to introduce Shellac nail gel that will leave your manicure looking fresh for up to 14 days! Shellac nail gel is a revolutionary polish that will allow your manicure or pedicure to last up to 14 days without chipping or loosing its shimmer. So how is it that nail perfection is now able to be so easily maintained? The answer lies in its specialized formula created by Creative Nail Design (CND) from a distinct combination of solvents free of formauldehyde, toluene, DBP or other harmful chemicals often found in nail polishes. First, the base coat is applied to the nail in order to secure the foundation for the polish. Then you let your nails dry under a UV light for ten seconds. Next your color coat is applied and you once again place your nails to dry under the UV light, this time for 2 minutes. Then, a second coat of color is applied followed by another 2 minutes of drying in the UV lights, and finally the top coat is applied to lock everything into place. If you are concerned about the use of Ultraviolet lights, it is best to wear sunscreen on your hands as an added precaution. Why choose Shellac nails over other gel nail treatments? Well, aside from the obvious reason that Shellac nails will last you up to two weeks chip free- its also trumps other gel nail treatments as it possesses an effortless application and removal process. For example Shellac nails take at most only 30 minutes to apply, whereas a soak-able soft gel nail treatment takes 45 minutes, and hard gel nails fall upward at 60 minutes for application time. In addition to saving you time spent at the nail salon, Shellac nails brush on like polish while the previously mentioned methods lack this ease of application. Shellac nails come in the same wide variety as regular polish, allowing you the freedom to pick whichever pop of color you’re seeking. The removal process mirrors that of the application process as both are simple and quick. Shellac nails take a mere 10 minutes to remove as they easily wipe off while both soak-able soft gel nail treatments and hard gel nails take a minimum of a half hour to remove and require the use of filing. Why waste more time than necessary spent uncomfortably in a nail salon? Dyanna Spa understands the fast paced lifestyle of its New York customers and acknowledges the importance of saving time when possible. Shellac nails allow you the possibility to stay out of a salon for up to two weeks while also minimizing your appointment time. Make an appointment with Dyanna Spa today to experience how the longstanding flawless appearance of Shellac nails are setting a metamorphosis to the nail treatment industry. To schedule your Shellac manicure, stop into Dyanna Spa or book your appointment online or via phone!